Our survey results showed overwhelmingly how critical web sites are to prospects as they evaluate whether or not to use your services or buy your product. 87% of respondents said they check out the web site of a new product, service or business, and 96% admit that the web site highly affects which product or service they choose. 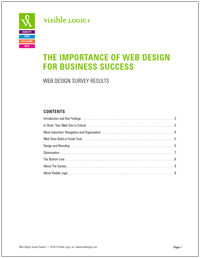 Additionally, 100% of our respondents admitted to leaving a web site because it was poorly designed or difficult to use. 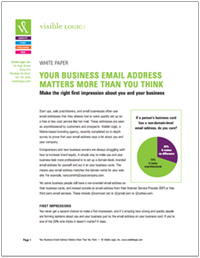 Start ups, sole practitioners, and small businesses often use email addresses that they already had or were quickly set up on a free or low cost service like Hotmail. These addresses are seen as unprofessional by customers and prospects. Visible Logic, a Maine-based branding agency, completed an in-depth survey to prove that your email address says a lot about you and your company. And you probably should start using a branded-domain for your email address. Establishing your brand and how your product or service differentiates from your competitors is the first step in building brand equity and increasing revenues. But companies often miss the second, crucial step: communicating this brand through professional graphic design. 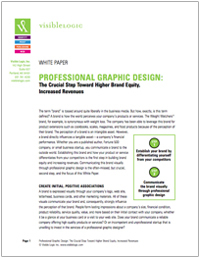 This white paper will show you how to achieve significant ROI with compelling, consistent graphic design.